In previous posts in this series I looked at all the available evidence from Tolkien's many writings to calculate population estimates for Elves, and then Men, Dwarves, Ents and Orcs in Beleriand in Tolkien's 1st Age, the time of the Silmarillion. In this next pair of articles I continue using the same method to calculate population estimates for Middle Earth during the 3rd Age, just prior to the events of the Lord of the Rings, Tolkien's most famous Epic. I use what sparse figures we are given in Tolkien's writings, relative and contextual statements about the size and organisation of settlements and cities, and the most relevant parallels to real world civilisations to calculate the beste possible estimates for the populations of the various countries described in Lord of the Rings. I hope to eventually give estimates for the Mannish kingdoms of Gondor and Rohan, to the Hobbit Shire, Elvish Lorien and Rivendell, and the Dwarvish Kingdom under the Mountain. Finally, I will attempt to give a rough total population figure for the entirety of the West of Middle Earth at the end of the 3rd Age, just before it was devastated by the War of the Ring. In this Part 1 I begin by looking at Rohan and Gondor, the two largest kingdoms of Men, for which we have the most information, and the centre of much of the fighting in Lord of the Rings. In part 2 will go on to look at the numerous other smaller settlements of Men, Elves, Hobbits, Orcs and others. I hope you enjoy it. If you agree or disagree with my estimates or calculations here I would love to hear what you think in the comments below. The only figure for Rohan we have is the size of its army. According to the Unfinished Tales the Muster of Rohirrim was made up of 100 eoreds of 120 riders each, or a total of 12,000, not including the King's guard. It also states that this refers to a couple of hundred years previously to the War of the Ring, and the population of Rohirrim had increased since then. This implies just prior to LoTR that the total of Riders could, in extremis, have numbered as high as 15,000. Obviously this would be a theoretical total only. For example, after losses in the war with Saruman, and due to the great need for haste, Theoden only rode with 6,000 riders to Minas Tirith, giving a sense of what was actually practically possible. But still, this 12,000-15,000 is the best figure we have for the whole of Rohan. In addition to the Riders Rohan also had infantry. Rohan was largely modelled on an Anglo-Saxon-ish society, with added horses, and it appears this Infantry was conceived as similar to the Fyrd of Anglo-Saxon England that famously fought at Hastings. That is, a territory based part-time defensive militia, as opposed to a mobile professional armed force. This coheres with the references we have to this infantry, which are always of the type of 'Men of the Westfold', or some such, implying they were based in a territory to fight in defence of that territory, rather than being part of some standing army of Rohan in general. We have no figures how many the total 'Fyrd' of all Rohan would have been but the numbers of Infantry referred to seem to be somewhat similar to the number of riders, references are to hundreds and thousands. That said the infantry would almost certainly have outnumbered the Riders, even in as horse-orientated a society as Rohan, due to the considerable cost associated with maintaining horses, and the more part time nature of this force. The complete Rohan 'Fyrd' then probably numbered around 20,000, giving a total possible force of around 35,000. I think this is pretty solid as a theoretical total unless we assume that the Riders and Infantry overlapped depending on the demands of the situation, except for presumably a small professional core. This could reduce the total combined force that could be raised as either Riders or Infantry to perhaps as little as 20,000 in total. The next question we have is what proportion this makes of Rohan's total population. Riders are perceived as almost but not quite equivalent to the Knights of the early medieval period, around the time of William the Conqueror. That is, professional, trained, well equipped soldiers capable of both tight manouvering and serious fighting. The strong implication is that they're not just any old farmer on an old horse. Interestingly this is also true to a certain extent of the infantry as well. While definitely less professional and full-time than the Riders, they are, again, not portrayed as random peasants with a scythe in their hands. They fight highly successfully against full sized, equipped and murderous Orcs in both attack and defence, even when outnumbered. They are also obviously at least reasonably well equipped, trained and organised. Actually, this mirrors quite close the Anglo-Saxon fyrd, which although sometimes pictured as a nationally conscripted citizen militia, was actually made up of more well-off freemen who could afford both military gear and time away from their property to go on campaign. This must to some extent have been true of Rohan as well. This all means that the 35,000 must have constituted only a fraction of the adult male population of Rohan, as one would expect from a low-tech settled, peasant society. I think it would be fair to assume that the infantry would constitute around 1/4 of the supporting adult male population, Riders, more expensive, more professional, would need economic support to sustain them, perhaps 1/8. If we combine these figures we can generate at least a reasonable population estimate for all Rohan. The result of this is that the most accurate estimate is probably in the range of 400,000-600,000 people across Rohan. In LotR we actually see surprisingly little of what appears to have constituted most of Gondor in terms of population, that is, the"populous southern fiefs" to the west of Minas Tirith. This is understandably unhelpful in terms of calculating population figures, but we do have some data to work on. The troops sent to reinforce Minas Tirith from the southern provinces numbered a little under 3,000 and apparently represented a tithe of the troops these provinces had available. That obviously gives a total figure of 30,000. To this we need to add the standing forces of Minas Tirith: the City Guard, the Rangers of Ithilien, the troops guarding the Pelennor wall and the troops at Cair Andros. These standing forces were substantial but not vast, probably numbering a further ten thousand, possibly more. It would also make sense to take into account a contingent for Gondor's Navy, of say 5,000, which still apparently existed in the period leading up to the War. If we take a total for Gondor's strength of 45,000 this would probably be close. Gondor's armies would probably have constituted a smaller percentage of its population than in Rohan. Gondor is a more established, more 'civilised' society that Rohan, even at this late stage and hence, as in modern societies outside conscription, probably had a considerably lower proportion of troops to total population than Rohan. This would have varied considerably by area. 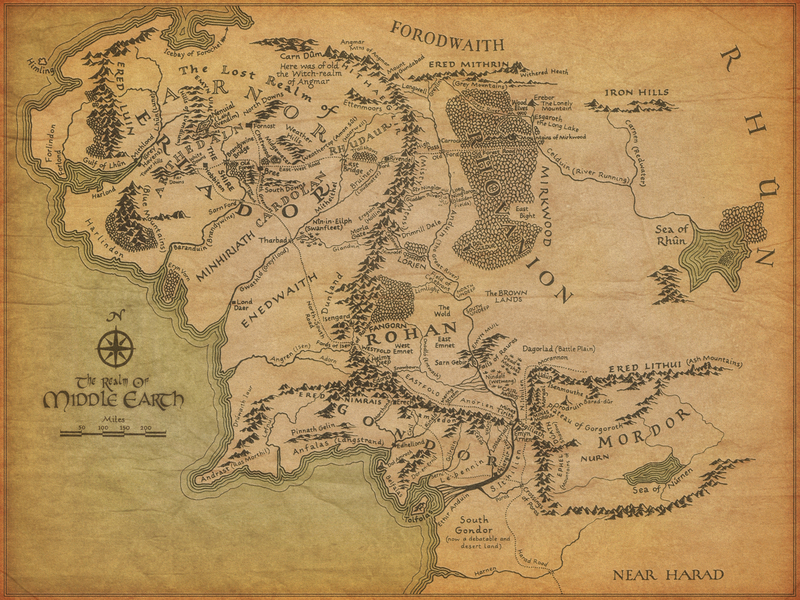 Gondor's original population was concentrated on the Anduin valley, between Minas Anor and Minas Ithil. 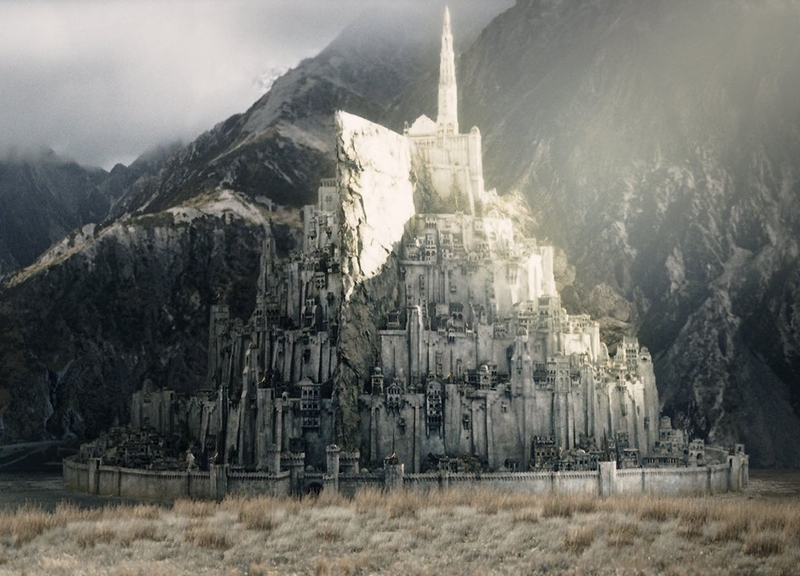 Minas Tirith, originally Anor, was itself originally founded to guard against attacks from Wild Men to the west! Long before the time of LotR, though, this situation had completely changed. Minas Ithil was taken, Osgiliath (once a great city) abandoned, and all Ithilien depopulated apart from the secretive Rangers and the majority of Gondor's population now lived to the west, shielded from Mordor by Minas Tirith and the standing forces who guarded the Anduin. Gondor's standing armed forces, of, we assume, around ten thousand men, would have been partially supported from Minas Tirith and Anorien and partly from taxes from the other provinces. The provincial levies would have been a slightly different story, being supported from their own territories and only called upon in time of general invasion or warfare. In many ways Gondor mirrors the medieval Byzantine Empire, both consciously (Tolkien even referred to Minas Tirith as such) and unconsciously, in terms of relative geography, age, level of civilisation, political structure, level of technology etc . Minas Tirith and Osgiliath between them even have great similarities to the ancient city of Constantinople. So, the Byzantine Empire is a good means of taking various parallels to Gondor. One would be the size of Minas Tirith. At its height Osgiliath would probably have had a population around 500,000 (equivalent to Constantinople at its height), but after long centuries of decline, plague and war, by the time of LotR the population of Minas Tirith would quite probably have declined to around 50,000, with the entire Pelennor and near surroundings supporting perhaps 100,000. Taking into account that the city was evacuated of women and children prior to Sauron's attack, the actual population during the siege may have numbered no more than 30,000, which again would map with the population of Constantinople at its fall. As for the population of Gondor in general, our first guess is that it would be presumably at least twice, if not three or four times that of the much smaller country of Rohan, so in the range of 1-2 million. Looking at the figures for the two types of troops we have for Rohan we can do similar calculations as we did for Rohan. The 30,000 provincial troops would represent perhaps 1/8 of the male population of fighting age, the 10,000 standing troops perhaps 1/14 of the supporting population. This gives the following calculations. 30,000 x 8 + 15,000 x 14 = 450,000 'adult' males, 450,000 x 2 = 900,000 adults and 900,000 x 4/3 = 1.2 million people. This figure probably broadly accurate, though it obviously varies considerably depending on what figures you think suitable for the multipliers. I think a figure of 1-2 million is probably as accurate as we can get. A 3rd and final way of calculating this population involves utilising another parallel with Byzantium thanks to the work of a guy called W.Treadgold. Treadgold worked out that the total number of troops in the Byzantine Empire actually stayed a relatively constant proportion of the total population despite otherwise vast changes, advances, setbacks and the passing of Centuries. Between 300-1080 AD the size of the army was always between 1.5-2.5% of the total population. Utilising this gives us another estimate for Gondor's population of roughly 40,000/0.02 = 2 million or 1.6-2.6 million, agreeing with our range of 1-2 million. That completes part 1. In the 2nd and 3rd part I look at the populations for the other settlements of the late 3rd Age including the Shire, Lindon, Rivendell, Lorien, Iron Hills, Mordor and more, and then attempting to give a final rough figure for the population of Middle Earth. I hope to see you there. Very nice! Even tought this is a bit more of a guess than Beleriand`s. I quite like the number for gondor, but I think you are a little kind to the rohirrim, I would imagine their population to lay around 140 000ish mostly because saruman would never invade an country able to mass a force nearly 4 times as large as their own. Also I thought tolkien only stated in a letter that the armour of the rohirrim would look alike the Saxons. I also think of Rohan as this viking comunity, where everyone knows his way with a sword/axe/spear/bow but they are all farmers first and soldiers second, and the only professionals in Rohan are the kings eored and the eoreds of the Marshalls(maybe some regualars at Hornburg and other important places). The rohirrim also reminds me a little of a mixture between the native americans(sioux). the horse has a central place in their culture and they use it alot, they would probably therefor keep many times more horses on their wast planes than they could ever dream of using. I don't find such a low figure for Rohan believable for the reasons given in the article, notably the separation between Infantry and Riders, the significant quantities of both, and the high level of equipment and competence they are described as having. Meaning they must have been supported by a wider population. Even viking society had this. War-bands were actually quite small compared to the total scandinavian population. The 35,000 figure is essentially theoretical. I don't think that entirety could be gathered under arms, except in very extreme circumstances. Because it is so complete though I believe it can be used as the basis of population figures as shown. Your figure of 140,000 would give a adult male population of as low as 45,000. One could get a lower figure than I give by assuming that most riders/infantry overlapped, so instead of having 15,000 riders and 20,000 infantry there were perhaps a few thousand full time riders and then 10-20 thousand who would serve as riders or infantry as need or equipment allowed. But even this lower figure gives a total military of around 15,000 and hence an adult male population considerably larger. There's just no precedent for an early medieval peasant society maintaining 1/3 of its adult male population as a reasonably armed, organised military force. I think the lowest one could reasonably go would be 200,000 but consider that less likely than the estimate given in my article. Though I agree that my lower end estimate of 400,000 is almost certainly more likely than my higher one. Uhh,,,35,000 in the army? There are 85,000 orcs in Mordor (75,000) of them marching into Minas Tirith, and another 125,000 Easterlings (evil men). The forces of good dont seem that outnumbered after all. Not sure about the haradrim that came with the mumakil to Minas Tirith or the corsairs of umbar that were slain by the Oathbreakers. That figure is for Rohan, and as I said is largely a theoretical figure if Rohan could mobilise every single rider, and every single trained militia-man in the whole of Rohan. Due to the constraints of a early-medieval agricultural economy this could never actually happen, especially beyond its own border as I doubt the militia could be mobilised outside their own geographic territory. Gondor definitely had forces of that scale. But due to the threat of the Corsairs, the relative economic decline and disorganisation of the Kingdom etc, they still never got anything like that into battle. That said, 30,000 to 200,000 seems pretty badly outnumbered to me. The forces that surrounded Minas Tirith were at maximum 100 thousand with 18 thousand haradrim 7 to 10 thousand easterlings( most of them fought against Dale and Erebor) and 40 to 50 thousand orcs(1 army leave Minas Morgul and it is said that more than one could come from the black gate and indeed one did it and took Cair Andros). There was 1500 men defending osgiliath including more less 300 hangers, 2 to 300 men defending Cair Andros and 4 thousand men in minas tirith counting the reinforcements and the defense of the city.We must never forget that Minas tirith forces use to be larger but they were in constant war in Osgiliath, Cair Andros and Ithilien. I say this because when Aragorn decided to go to the black gate with 7 thousand men, he left behind a force greater than that, that was defending the city. When the siege has begun the city have had a force of five thousand(or less) men defending the walls and the gates since it was said that Faramir had lost one third of his army in Osgiliath and few come back from Cair Andros. Then we all now that came 6 thousand men from Rohan, and Aragorn should lead a force of at least 3 to 4 thousand men since he came with a large force from the southern fiefs and from Lebennin and Lamedon(great city). Than we can say there was 14 to 15 thousand good good guys against more than 70 thousand bad guys. When the battle was over 4 thousand men from Pelagir was in the way of the city but first she was going to pass in Lossarnach, to increase the forces? i don´t know probably yes. Then if you take those 4 thousand and adds some defense left in the city and Lossarnach that would probably sum more than the forces that were defending Minas Tirith in the beginning. Minor point....Minas Tirith was known as Minas Anor, not Minas Arnor. Arnor was the relam to the North which Elendil, the High King ruled. Minas Anor was built by Elendil's son, Anor in Sindarin means Sun. Minas Anor was built by Anarion (Quenya means sun or son). Anarion was the second son of Elendil. In Sindar Arnor means Land of the King, or more literally High-Land. Oh my God, you're right. Thanks for pointing that out. I've been writing and saying it wrong for years. Mobilising 10% of the population, training, arming and equipping them was basically impossible for societies before the Industrial Revolution. England in the 11th Century probably had a similar population to Gondor, about 1-2 million. They managed to mobilise 7,000 men at Hastings. Double or Triple that to account for the speed they had to mobilise that army, and earlier losses, you still get a tiny number. Similar figures apply whether you're looking at any medieval army, or the classical Romans, Byzantines, or anyone else. But wouldnt the constant warfare against mordor mean that they would have more men at the ready. Since the brits hadnt fought a war spanning centuries when Hastings happened, i would think that they would have less men ready and equipped to fight but for gondor the orcs have been roaming around for a long while. Wouldnt the rulers ensure they have a deeper pool of manpower by investing more in militia? That is just pure guesswork by me but i tink it makes sense. The figures for Gondor's soldiery are derived directly from the books. The levies at Minas Tirith were "a tithe" of the strength of the provinces, plus the troops at Minas Tirith and the Ithilien rangers themselves. If Gondor had 100,000 troops where were they? As I say in the article Gondor's armed situation was comparable to the Byzantine or Roman situation, and those were societies that were also at near constant war against one barbarian horde or another. It is made quite clear by Tolkien that the constant warfare had worn Gondor down as well. At its height Gondor's forces would certainly have been perhaps as high as 100,000. 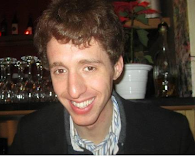 Your post has been very helpful; thank you! I was looking for the population of Minas Tirith because in a fanfic novel I'm writing, I mention a farm in the Pelennor Fields and their difficulties in rebuilding it after the battle and the end of the WR. What I'm wondering is if it was possible immediately before and during the WR for the farmers there to sustain the city with their meat, poultry, crops and produce as well as themselves. After all, I imagine that imports were down during that time, not only foreign, but also from the more southern provinces and Anorien, who were hard-pressed by orcs, and nothing would be coming from Ithilien but trouble. I would think that Minas Tirith would be supported both by local produce and imports in the initial period after the war. We must remember that the city had a much smaller population during the actual war, it had been in decline for centuries and most of the women and children had been evacuated. These would not have returned until food supplies and other lines of supply for essentials had been secured. You can perhaps imagine people steadily moving back to the city and the population growing over the years after the King returned, but in the immediate aftermath there would have been relatively few people and a lot to be done to pick up the pieces, with imports from the southern fiefs making up a lot of the difference. how many soldiers does each area of gondor have at start of War of the Five Kings? How many soldiers does each area of Gondor have at start of War of the Ring? How many soldiers does each area of Westeros have at start of War of the Five Kings? How many soldiers/population does Gondor and arnor have second age at peak? Tolkien describes the levies of Gondor arriving at Minas Tirith in the Return of the King. This is described as a 'tithe' of their full strength, so you could take the numbers given arriving at Minas Tirith and x 10 to get sensible estimates. I think we can assume that the Prince of Dol Amroth probably brought more than 1/10th of his strength, but some of the wilder, more distant regions sent less. But either way you can get rough estimates. I would need a whole other article to answer that second question. The information for the second age is much more sparse and we could only give really quite loose estimates. I did the math regarding the population of Rohan, and came to 2,280,000. And for Gondor, I came to 7,410,000. Although still an interesting article, and quite helpful. Interesting. Would be fascinating to hear what your calculations are?